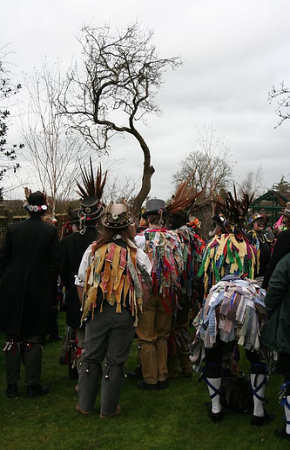 Wassailing is the pagan fertility rites carried out on Fruit Trees to awake them and has been celebrated in England including the Cotswolds since the 1400's. This is the popular image of the traditional folk custom of fruit trees - a ceremony intended to begin the process of waking the fruit trees from their winter slumber and the first fertility festival of the folk calendar. The word wassail derives from the Old English words wæs (þu) hæl which means variously ‘be healthy' or ‘be whole' - both of which meanings survive in the modern English phrase ‘hale and hearty'. Thus this is a traditional ceremony which seeks to start off the first stirrings of life in the land and to help it emerge from winter and to ensure that the next season's crop of fruit, especially apples and pears, will be bountiful. The most common date for this custom to take place is the eve of Twelfth Night or Old Christmas Eve, ie 5th January, just at the end of the midwinter period when the Wild Hunt rides and chaos traditionally rules as the otherworldly horde broke through into human realms. In some cases, however, the ceremony takes places a little later, on 17th January, depending on whether the celebrants prefer to follow the old or new calendar. Either way, we might see this first fertility ceremony of the year as marking a return to human "normality" after the dark and dangerous days of midwinter. Either way, the date on which wassailing takes place is at least a couple of weeks before Imbolc, the festival which for modern pagans is generally as being the first fertility festival of the year. For reasons of tradition, orchard wassailing is concentrated in those parts of England where the growing of hard (orchard) fruit is concentrated ie in Somerset and Devon; in Worcestershire and Herefordshire, in Shropshire and Gloucestershire and, to a lesser extent, in Kent. The custom appears to be less ingrained in local practice in Kent, which is known as the Garden of England, where most fruits were grown for the table. In the other areas mentioned, especially in Herefordshire and Somerset, alongside the various varieties of eating apples, the crop is traditionally of special varieties of apple which are too high in acidity for eating and which are therefore particularly suitable for cider (or even scrumpy) making and of similar varieties of pear which are used to produce perry. 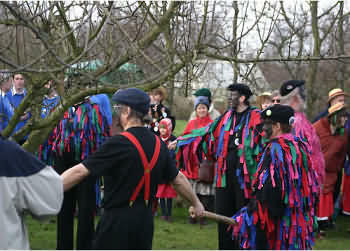 Thus wassailing is most prevalent in Herefordshire where it is concentrated in the ancient cider and perry orchards. 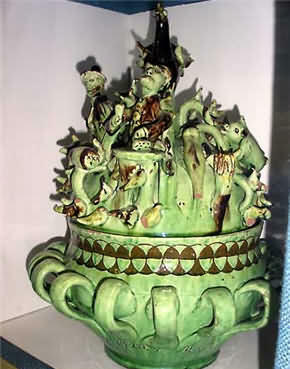 Many families who practice wassailing their trees keep a special wassailing bowl, which may be of some sort of ceramic (for example earthenware or porcelain) or turned from wood, though one or two silver ones have survived in richer farming families. Whatever the material, the wassailing bowl is often not unlike a punchbowl in having handles either side for ease of carrying and is very rarely used for any other function. 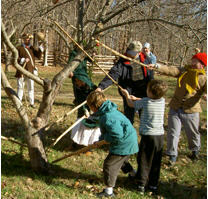 The wassailing ceremony frequently begins just before dark when the wassailing cup (or drink) is prepared. Many recipes survive for this but in the south Cotswolds a drink called Lamb's Wool, made of hot ale, eggs, spices, sugar, cream and roasted apples, was traditional. In other places plain cider was used and in yet others it was hot spiced ale. Despite the fact that wassailing is strongest in cider and perry areas, the beer or ale-based recipes are generally considered to be older and more traditional than those based on cider. After dark those taking part process down to the orchard, ceremonially bearing the wassail bowl filled with the prepared booze. They also carry large sticks and such items as shotguns, drums, kettles, pans and whistles - anything which can be used to create lots of noise in fact. and in Sussex, where wassailing was sometimes called "howling", the following was used. The custom usually continues with the tree or trees being beaten about the trunk (and any branches within reach) with the sticks. This is believed to begin the process of awakening the tree and starting the sap flowing up the trunk. It is accompanied by much shouting and the making of as much noise as possible, and shotguns are commonly fired up into the branches. Again, this is believed to assist the tree in awakening from its winter sleep as well as frightening away any evil spirits which might be lurking in the branches. 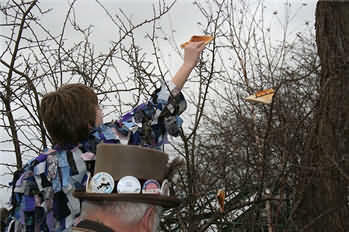 In Sussex, it was not uncommon for all present to bow to the trees, and sometimes a small boy was lifted into the branches where he would receive offerings of bread, cheese and cider (the mainstay of ordinary folks' diet and therefore the foodstuffs which would have been of most immediate concern to them), possibly representing the spirit of the tree receiving the gifts. At Brinsop in Herefordshire, according to some, there was an allied custom still alive in which men would stand in a circle by the fire, chanting three times the words "Auld Ci-der". On each of the three syllables they would bow into the circle, making nine bows in all. The first two notes were sung at a normal pitch but the last, the "-der", dropped to a low growl a full octave below the other notes. The effect was a "weird, dirge-like effect" which one might expect to be profoundly hypnotic if repeated continuously for any period of time and more than likely a damned good invocation of the spirit of cider and the apple tree! Also in Herefordshire and Monmouthshire, a round plum cake with a hole in the middle was stuck onto one of the horns of the largest or best of the bulls which was then prodded and tickled to make him toss his head and throw the cake. If it was thrown forwards, this was believed to be a good omen for the coming harvest, but if it fell backwards a poor harvest was forecast. A number of other folk customs have been recorded at the New Year period in Herefordshire and surrounding counties, including that of carrying a weaving of a globe or hawthorn twigs which is then set alight and carried around the fields where crops have yet to be planted or where the seeds lie awaiting the warmer weather. There is a record of a ceremony of this sort, called Burning the Bush, at Brinsop in Herefordshire and suggest that the carrying aloft of a burning branch or bush may symbolise the returning sun and lengthening days. There are records that this custom had been very widespread on farms and in villages in Herefordshire and Radnorshire (just over the border into Wales) during the 19th century and that it was still carried out in a few places at the beginning of this century. In parts of Worcestershire, on New Year's morning, a crown was made of blackthorn which was then baked in the oven before being burned to ashes in a cornfield, the ashes then being scattered over the ground. Sometimes simple libations of cider or beer were made to crops or pieces of cake buried as offerings. In Normandy in France on the Eve of Epiphany or Old Christmas Eve (ie 5th January) lighted torches or brands were thrown at the trunks of fruit trees and small bonfires of straw lit under their branches. It was apparently considered vital that the fires were lit by a child below the age of 12. There was also a time when wassailing was not confined to country people, for there are accounts that a form of wassailing was carried out at court in the reign of Henry VII (1485 - 1507) when it was recorded in the Collection of Ordinances of the Royal Household. A most interesting addition to the basic wassailing formula was recorded in the late 18th century in Devon where the men, returning from the orchard to the house, found the doors barred by the women who denied them entry until one of their number could correctly guess what was impaled on a spit. Invariably this was some titbit or sweetmeat which was given to the man who guessed correctly. There appear to have been other British customs involving the wassail bowl. The most widespread involved a bowl of hot spiced ale or cider being carried around from door to door in a community by a group of young people. In some cases householders who were visited were expected to give a little money to the wassailers who either then gave the donor a drink from the bowl or drank to the health of the donor and his family and household. In other cases, the wassailers engaged in a series of challenges or riddles with the householder and sought to gain entry to the house by wit or persuasion. If they succeeded then they were given food and money, though the accounts I found of this version did not make clear whether the householder's health was drunk or not.